After a period of absence, Ivan Brehm, former Executive Chef of The Kitchen at Bacchanalia, is back in the game as chef-owner of newly opened Nouri, a new outfit at Amoy Street the Brazilian native opened in partnership with Unlisted Collection. Brehm is no stranger to Singapore’s f&b scene, having opened Bacchanalia at Masonic Hall before it moved lock stock and barrel to Hong Kong Street and re-opened as The Kitchen at Bacchanalia, where the one-time Development Chef of The Fat Duck’s experimental kitchen snagged a star for his former employer. 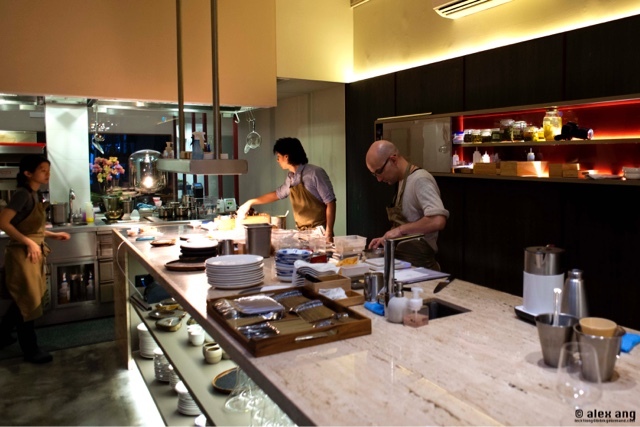 At his minimalist new digs at Amoy Street, Brehm wants diners to eat in his kitchen and to break any potential barrier, he places his open concept kitchen smack bang in the heart of the dining room, which is bookended on one end by the oven and stove, and the other by the 12-seat marble top connected to the pass. Those who’ve dined with Brehm knows that this upward-depilated chef serves a borderless cuisine that hinges on continuous experimentation of cooking techniques, flavours and ingredients. 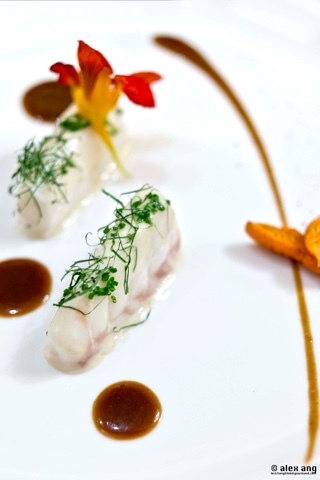 While some say that he serves avant garde or experimental cuisine, Brehm now brands it as “crossroads cooking”, for a unique cooking style that bridges the common food traits found across different cultures (think kinilaw-ceviche, vatapa-curry). At the moment, lunch is available as a series of sets as well as an omakase (priced at $85++ excluding bread) while dinner is available exclusively as a five-course and seven-course tasting menu (priced at $140++ and $170++ respectively), the former being a subset of the latter. Nouri is named for nourishment and if that brings to mind mum’s cooking, you cannot be more wrong, notwithstanding the same noble ambition. 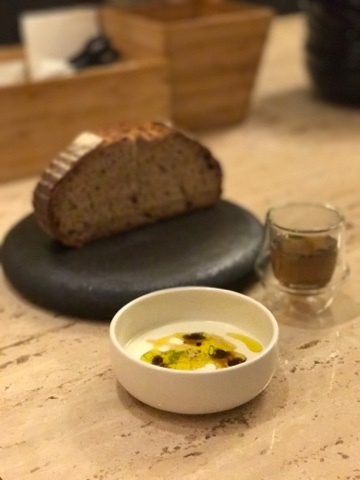 At the vanguard of Brehm’s mentally and physically nourishing menu is a reboot of his bread and broth course: naturally leavened sour dough served with a shot of steam-extracted essence of Cameron Highlands-grown celery, onion, iceberg lettuce, celeraic, leek and fennel with shiitake mushrooms. Alongside this opening dish is a riveting “silken cheese” dish that is so good that you can eat it on his own. It’s not unlike silken tofu in texture but made entirely with steamed infused milk crowned with grated nutmeg, lemon zest and pickled nutmeg flesh. With this entourage, Brehm sets the bar high for mum’s nourishing fare. The succeeding dish of tomato and oats is equally, if not more, wholesome. 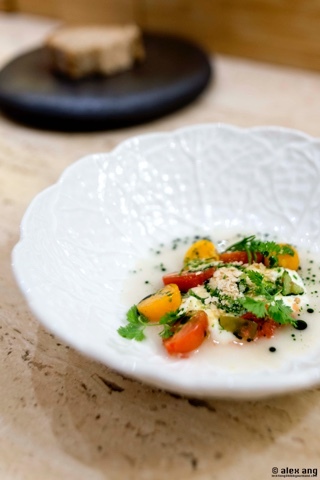 Fresh and fermented cherry tomatoes, tomatillo and gooseberries arrive in a shallow bath of basil oil infused oat broth with rolled oats, burrata from Puglia and petai leaf. Flavours wise, it’s muted earthy and creamy with a dose of acidity, thus setting the tone for the ensuing savoury courses. Contrary to my expectation, the highlight from the lighter side of the savoury courses is not the King crab dish with lardo but “mushroom”. 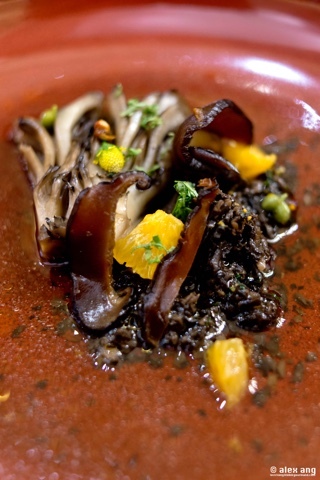 A trio of fungi – maitake mushrooms, black trumpet and black truffle puree – is steamed and served with mandarin orange segments Sancho pepper and Szechuan peppercorn in a Brazilian chilli mushroom consommé spiked with Brazilian jambu and Szechuan oil. Deliciously comforting, unless you’re not a fan of mushrooms. 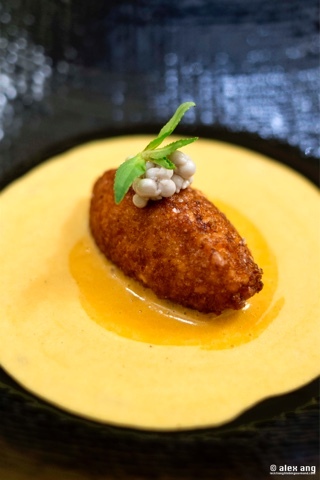 Inspired by acarajé from his motherland, Brehm also serves a course of white pinto bean fritter in a pool of prawn coconut milk curry encircled by turmeric curry. The familiar curry flavours hit a home run indeed but the plate is let down by a hard – rather than crisp – fritter. It’s probably an isolated hiccup. For mains, the current menu gives you an option from three choices – chicken, wagyu or fish. I can’t say that I know the chicken two ways but Brehm sends us a taster of the “cheong fun” that comes as a side: chicken thigh and white pepper enrobed in velvety house made “cheong fun” served with fennel oil studded with pomegranate, depicting Brehm’s decidedly western take on the popular dim sum item. If you’re a beef person, the wagyu two ways will be a no-brainer winner. You are first served wagyu and kimch nduja, a mix of steak tartare and kimchi prepared with brined cauliflower and daikon marinated for up to seven days in chilli paste. 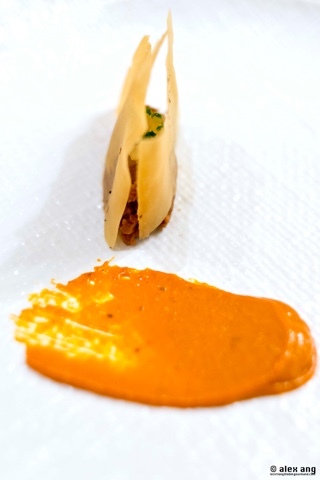 Served sandwiched in lavosh (paper-thin Middle Eastern flatbread), you eat with your hands and dip it in cashew nut romesco. 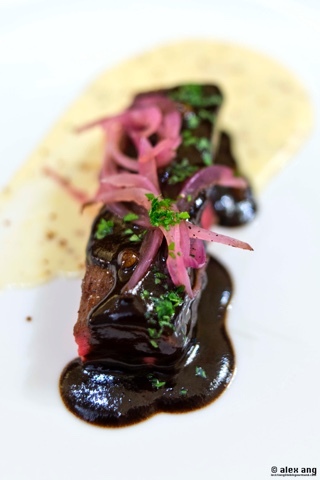 For the main dish, it’s a chunk of grilled Ranger’s Valley rump cap drizzled in Brehm-made A1 sauce infused with bone marrow and buah keluak. Solid dish, great sauce. Fish lovers will adore Raymond’s grouper two ways. 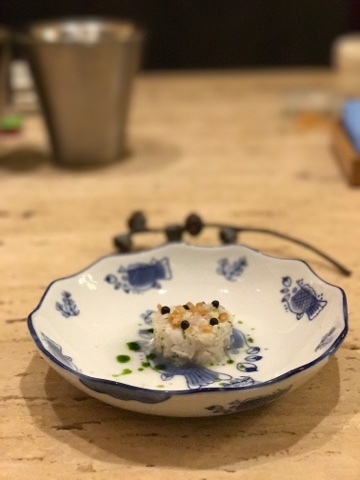 The mildly flavoured kinilaw dish of fennel vinegar-cured grouper with peppercorn brine, wild ginger and coconut oil is not your usual ceviche-punchy deal but it’s quite a standout. The main dish of poached grouper in its pilpil-like fish sauce reduction alongside an unlikely companion of Tahiti vanilla flavoured Sarawak black pepper sauce is just as well executed; the moist fish and its sauce pairing is unusual but the combination pulls off unusually well. While I don’t know the fishmonger Raymond and have never met him, his fish veers subtly on the “muddy” spectrum flavour-wise. In true fine eating tradition, dessert arrives in a parade of three courses: a pre-dessert followed by two sweets. While I have a serious admiration for the Tahitian vanilla ice cream with banana rum foam, buckwheat crumble and calamansi zest, I can’t help thinking of the clever sunchoke dessert Brehm served me several months before he left The Kitchen at Bacchanalia. 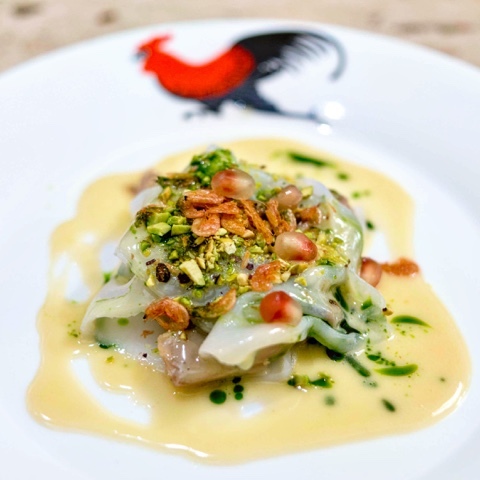 Having seen Brehm grow in his years in Singapore, i sense that he is truly in his element at Nouri. But having tasted various iterations of his cuisine, his current menu, while great for a brand new restaurant, is punching just a little below his weight. In truth, its still early days; knowing Brehm and the heavyweight that he is, his opening menu will evolve into something that is not just nourishing but dazzling too.